Shear forces between cells occur during global changes in multicellular organization during morphogenesis and tissue growth, yet how cells sense shear forces and propagate a response across a tissue is unknown. We found that applying exogenous shear at the midline of an epithelium induced a local, short-term deformation near the shear plane, and a long-term collective oscillatory movement across the epithelium that spread from the shear-plane and gradually dampened. Inhibiting actomyosin contraction or E-cadherin trans-cell adhesion blocked oscillations, whereas stabilizing actin filaments prolonged oscillations. Combining these data with a model of epithelium mechanics supports a mechanism involving the generation of a shear-induced mechanical event at the shear plane which is then relayed across the epithelium by actomyosin contraction linked through E-cadherin. This causes an imbalance of forces in the epithelium, which is gradually dissipated through oscillatory cell movements and actin filament turnover to restore the force balance across the epithelium. Mechanical forces play important roles at the single-cell and multicellular levels in tissue biology (Farge, 2011; Hoffman et al., 2011), including in the regulation of cell shape and movement (Aegerter-Wilmsen et al., 2012; Legoff et al., 2013; Mao et al., 2013; Clément et al., 2017), cell-cycle progression (Campinho et al., 2013; Streichan et al., 2014), cell-division orientation (di Pietro et al., 2016; Gloerich et al., 2017), and gene expression (Aragona et al., 2013; Benham-Pyle et al., 2015). In general, these effects have been studied by observing the generation of cellular traction forces, or by applying external tensile forces to whole cell populations (Mukundan et al., 2013; Simmons et al., 2011; Tambe et al., 2011; Zaritsky et al., 2015; Micoulet et al., 2005). While a few studies have estimated the shear forces between cells from observations of cellular tractions ( Tambe et al., 2011; Zaritsky et al., 2015), none have perturbed a tissue with direct application of shear loading. In-plane shear forces exist within any solid material under load, such as between groups of cells in tissues under applied or intrinsic forces. These forces are distinct from shear stresses applied by laminar liquid flow on top of cells that mimic the vasculature. Tissues spontaneously generate internal shear forces to maintain an external force balance (Prost et al., 2015), and biopolymer networks have been observed to pull inward when sheared on a rheometer (Janmey et al., 2007). In-plane shear forces are thought to affect the collective behavior of migrating cells in epithelial tissues (Tambe et al., 2011; Zaritsky et al., 2015). For example, the ridges that appear in the epithelial tissue forming the pupal Drosophila wing have been attributed to shear forces arising during development (Etournay et al., 2015). In addition, shear forces between migrating cells of the prechordal plate in the zebrafish embryo and cells of the neurectoderm determine the position of the neural anlage (Smutny et al., 2017). These studies suggest that local shear forces between groups of cells are important contributors to global effects in tissue motility and organ patterning. However, how local in-plane shear forces are spread throughout a tissue, which is important for understanding collective tissue behavior, is not understood in part because of the difficulty in applying direct and localized in-plane shear within a tissue. In order to close this gap, here we examined epithelial mechanics after we applied in-plane shear with a novel silicon device. We determined that in-plane shear produces local deformations that are propagated into a global migratory response that distributes and dissipates forces through oscillations. Confined epithelia, similar to embryos or tumors, have been shown to oscillate (Deforet et al., 2014; Kocgozlu et al., 2016), but the mechanism driving these oscillations is unknown. Such oscillatory behavior may be important as an intrinsic collective cellular process that follows a shear-induced force imbalance, enabling the probing and maintenance of tension homeostasis within a developing tissue. We designed and deployed a new silicon device (adapted from [Mukundan and Pruitt, 2009]) to apply localized shear to an epithelium while simultaneously observing cell movements and measuring forces across the epithelium (Figure 1A–C; Materials and methods). We fabricated devices from single crystal silicon-on-insulator wafers because silicon does not change elasticity over time (Hopcroft et al., 2010). The device consisted of two parallel 1000 μm x 250 μm suspended planks, one for force actuation and the other for force sensing. Moving the actuation plank applied 100 μm of shear (resulting in about one radian average cellular shear strain in cells near the mid-plane) at the midline of a Madin-Darby Canine Kidney (MDCK) epithelial cell monolayer cultured across the surface of both planks (Figure 1A; Materials and methods). We generated kymographs of cell movements using Particle Image Velocimetry (PIV) (Figure 1B), from which we mapped cell movements in the x- and y-directions relative to shear (Figure 1C; Materials and methods). We calculated force across the monolayer from the displacement of the sensing spring (ks = 0.93 N/m) (Figure 1—figure supplement 1). Shear induced inward/outward oscillations in cells in the y-direction and cell movements opposite to the shear in the x-direction. (A) Shear (100 μm) was applied to a MDCK monolayer adhering to the device planks (Supplementary Materials). (B) PIV was used to quantify the x- and y-direction velocities (green arrows) of MDCK cells expressing E-cadherin:DsRed over time. (C) Symmetric PIV data were averaged by ‘folding’ over the shear-plane. The color map displays the speeds of cell movement in the outward/inward (blue/red) y-direction relative to the shear-plane (0 μm y Pos. ), or in the opposite/with x-direction relative to the shear direction (blue/red, 30 μm/h). (D, F, H, J) y- (D and H) and x-velocity (F and J) kymographs from three independent experiments with 15 min binning of three 5 min PIV data of cell movements with (D and F, dashed black line) or without (H and J) shear over 20 h. (E, G, I, K) y- (E and I) and x-direction (G and K) cell movements based on numerical integration of y- and x-velocity kymographs over time, respectively, at positions 8, 50, 100, 150, 200, and 242 μm from the shear-plane (Figure 1—figure supplement 7). Insets provide greater spatial resolution of movement in the deformation zone (G and K, insets). Following the application of shear, the epithelium did not rupture or tear (Figure 1—figure supplement 2), nor was there significant extrusion of dead cells (Video 1). Throughout the response, cells within the epithelium retained their nearest neighbors, and new cell adhesions were formed only between daughter cells and their neighbors following division (Figure 1—figure supplement 3; Video 2). MDCK E-cadherin:DsRed monolayer imaged 1 hr before shear and 19 hr after shear. Cell tracking within MDCK E-cadherin:DsRed monolayer reveals cells retain their neighbors before and after shear. Representative image series of the middle third bottom plank of a shear MDCK E-cadherin:DsRed monolayer. 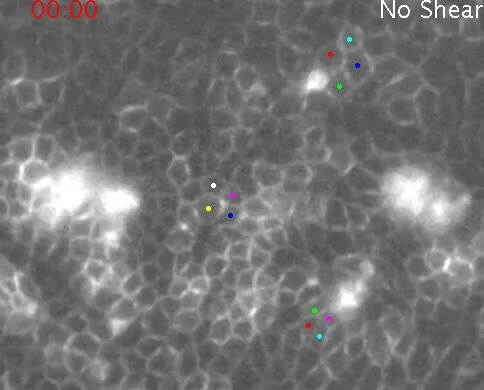 Cells were tracked in the shear zone, middle and at the edge of the monolayer using ImageJ’s Tracking plugin. Sets of 4 cells were tracked for 1 h before shear and 6.75 h after shear. The MDCK epithelium had a collective response to the application of in-plane shear (Figure 1D–G). Cells throughout the epithelium began a collective wave of inward y-direction movement toward the shear-plane, which started at the shear-plane and propagated to the opposite edge of the plank within 45 min at a rate 10x faster than individual cell velocities (290 vs. 30 μm/h; Figure 1D,E). This inward movement was expected because biopolymer networks develop an inward normal stress under applied shear (Janmey et al., 2007). In our live epithelium, cells reversed y-direction movements at 7, 11, and 15 hr after shear with decreasing velocity magnitude: they behaved as a damped oscillator (Figure 1D,E), with cells furthest from the shear-plane exhibiting the most movement in the y-direction (Figure 1E). Reversals in y-direction movement propagated from the shear plane outward at 80–100 μm/h. Cells adjacent to the shear-plane (2–3 cell layers,<50 μm) were deformed, and moved in the x-direction opposite the applied shear (Figure 1F,G). These x-direction movements diminished within ~1 hr, and stopped after ~3 hr. In this deformation zone, y-direction cell movements were small, outward, and short-lived. Cell oscillations in the y-direction, but not the x-direction, also occurred spontaneously without shear (Figure 1H–K; Video 3), at a cell velocity 3-4x slower than in the presence of applied shear (9 vs. 30 μm/h). It has been previously reported that MDCK cells plated on circular micro-patterns with 500 μm diameter, the same as the width of the two planks in our device, oscillated radially, but the origin and mechanism of propagation of these oscillations were unknown (Deforet et al., 2014; Kocgozlu et al., 2016). MDCK E-cadherin:DsRed monolayer imaged for 20 hr without shear. To examine whether there were changes in individual cell morphology after in-plane shear, we measured cell orientation, eccentricity, area, density, and perimeter over time. We found no changes in cell morphology or periodicity that matched long-term y-direction collective oscillations (Figure 1—figure supplement 4). Thus, inward/outward y-direction oscillations within the epithelium primarily represented collective cell movements rather than changes in individual cell morphology. While the deformation zone (2–3 cell layers) adjacent to the shear-plane exhibited cell-shape changes and horizontal displacement in the x-direction, this physical shear deformation did not occur (Figure 1—figure supplement 3, Figure 1—figure supplement 5) nor propagate to the rest of the monolayer (Figure 1—figure supplement 4A,B). Finally , there was no change in the localization of E-cadherin at cell-cell adhesions of migrating cells due to shear (Figure 1—figure supplement 5). We sought to connect these experimental data to the mechanical properties of the monolayer by using the known stiffness and displacement of the on-chip sensing plank to extract force as a function of time after shear (Figure 1—figure supplement 1). The measured position of the sensing plank was used to calculate the force experienced by the epithelium from images taken at 30 s intervals from 5 min before to 30 min after shear (Figure 2A). The measured force peaked (FMAX) immediately after shear, and then relaxed with an exponential decay characteristic of a viscoelastic material, where the time constant, τ, is defined as the time to decay by 63% as the epithelium relaxed and remodeled (Figure 2A). Epithelium oscillated over tens of hours to dissipate force imbalance generated by intrinsic or extrinsic shear forces. (A) The measured resistive force of the epithelium over 30 min in response to 100 μm shear displacement for +Shear relaxed with an exponential decay characteristic of a viscoelastic material (dashed line, time of shear; solid blue bar, 63.2% decay time constant τ; Figure 2—figure supplement 1). (B) The model captures mechanical properties of the epithelium as stiffness (k) and damping (c) elements in series with each other and in parallel with a mechanical signal storage and relay element (b). FINT represents the intrinsic shear force of the epithelium and FEXT represents the extrinsically applied shear force. (C, D) (Experiment) Unbinned (5 min) y-velocity kymographs for + Shear (Figure 1D) and -Shear (Figure 1H) were averaged in the y-direction to obtain the overall y-direction cell velocities at each time point with (C), dashed black line) or without (D) shear. The range (gray bars) and mean (black cross) of the data come from three independent experiments at each time point. Red lines represent the best fit of an exponentially decaying sinusoidal function (Figure 2—figure supplement 2B) to the average y-direction cell velocity for +Shear and -Shear conditions. (Simulation) Normalized output of the MATLAB Simulink/Simscape simulation for the mechanical model (Figure 2—figure supplement 1). Spring and dashpot elements have been used to model the elastic and viscous components of viscoelastic materials, respectively (Micoulet et al., 2005; Mukundan et al., 2013). While these elements are largely sufficient for modeling normal viscoelastic materials and living materials over short time scales, they do not capture the long-term behavior of active, living materials. The MDCK epithelium in our study behaved as a damped oscillator over tens of hours (Figure 1D,E,H and I). Therefore, we inferred that an additional mechanical element was required to capture the time required for mechanical signals to pass through the epithelium, and for the epithelium to generate forces and respond. The addition of a mechanical signal storage and relay element called an inerter, placed in parallel with the viscoelastic components captured these damped oscillations over tens of hours (Figure 2B). The size of the inerter is inversely proportional to the rate of mechanical signal transduction within the epithelium (80–100 μm/h in Figure 1D). The addition of an inerter to viscoelastic elements has been suggested before (Popović et al., 2017), but the configuration presented previously did not support the observed oscillations in this study. In our model, FINT represents the intrinsic shear force spontaneously generated by an epithelium to maintain an external force balance (Prost et al., 2015), and FEXT is the extrinsically applied shear force. Fitting our model with and without FEXT (+Shear, Figure 1D; -Shear, Figure 1H) to observed cell movements, we estimate that the FINT required to restore a force balance is 4X smaller than FEXT (Figure 2—figure supplement 1). To interrogate long-term collective epithelial behavior (Figure 1D and H), we averaged the y-direction cell velocities from kymographs for the +Shear (Figure 1D) and -Shear (Figure 1H) conditions. There was no statistically significant difference in the period or damping rate of oscillations (Figure 2—figure supplement 2C, p<0.05), but the amplitude of oscillations was higher with shear than without shear (Figure 2—figure supplement 2C, p<0.05). We used the MATLAB Simulink/Simscape environment to simulate the behavior of the mechanical models presented in Figure 2B (Figure 2—figure supplement 1; Materials and methods). The simulation (Figure 2C,D, Simulation) captured the observed long-term oscillations and damping after applied shear (Figure 2C,D, Experiment). Our models and simulations are in the y-direction , where they account for the shear forces as an inward step input of force (Janmey et al., 2007). The role of actomyosin contraction in shear-induced cell movements in the x- and y-directions was tested by adding the myosin II inhibitor blebbistatin (50 μM; (Straight et al., 2003)) 15 min before shear for 1 hr (Figure 3A–G; Video 4) or 1.5 hr after shear for 1 hr (Figure 3—figure supplement 1; Video 5). Addition of blebbistatin before (Figure 3A,B) or after shear (Figure 3—figure supplement 1A,B) inhibited all y-direction oscillatory cell movements, even after washout. Consistent with deformation of a passive material, x-direction cell movements in the 2–3 cell layer deformation zone still occurred after treatment with blebbistatin (Figure 3C,D), although the amount of cell movement was less than in the +Shear condition (Figure 1F,G). Sensing data revealed no statistical difference in FMAX but a much faster relaxation time (τ = 1.3 min) compared to the +Shear condition (Figure 2—figure supplement 2A, τ = 3.7 min, p<0.01). In our mechanical model, this faster force relaxation time corresponds to decreased damping (c), and the inverse relationship between the size of the inerter and the rate of mechanical signal propagation leads to a much larger inerter value (b) than in the +Shear condition (Figure 3F vs. Figure 2B). As expected, the vertical average of y-velocity kymographs (Figure 3A) did not exhibit any oscillatory behavior (Figure 3G, Experiment). The simulation (Figure 3G, Simulation) captured the absence of oscillations (Figure 3G, Experiment). 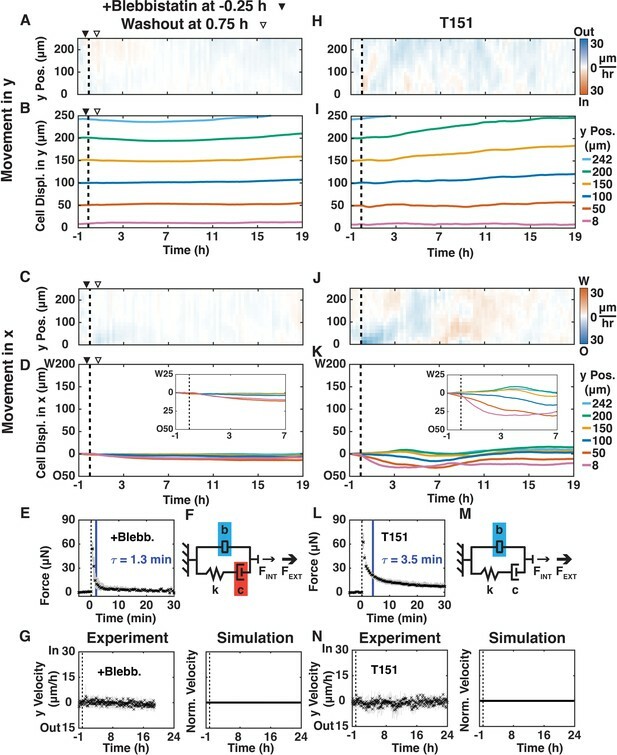 These results show that temporary loss of actomyosin contraction, before or after shear, decreases damping, suppresses collective oscillatory behavior, and prevents the propagation of cell movements away from the shear-plane. Disrupting actomyosin contraction with blebbistatin or loss of E-cadherin-mediated extracellular adhesion disrupted shear-induced y-direction cell oscillations. (A, C, H, J) y- (A, H) and x-velocity (C, J) kymographs from three independent experiments with 15 min binning of three 5 min PIV data of movements of MDCK E-cadherin:DsRed cells treated with 50 μM blebbistatin (+Blebb) (A, C) or of MDCK T151 cells (H, J) and sheared (dashed black line) over 20 hr. (A–D) Blebbistatin was added 15 min before shear (filled arrowhead) and washout one hour later (empty arrowhead). (B, D, I, K) y- (B and I) and x-direction (D and K) cell movements at positions 8, 50, 100, 150, 200, and 242 μm from the shear-plane for +Blebb MDCK cells (B, D) and T151 cells (J, K), with insets providing greater spatial resolution of passive movement in the deformation zone (D and K, insets). (E, L) Measured resistive force of the epithelium over 30 min in response to 100 μm shear displacement for +Blebb MDCK cells (E) and T151 cells (L) (dashed line, time of shear; solid blue bar, 63.2% decay time constant τ; Figure 2—figure supplement 2). (F, M) Values of the mechanical model elements presented in Figure 2B (+Shear) were increased (blue) or decreased (red) to capture the mechanics and movement of the epithelium. (G, N) (Experiment) Unbinned (5 min) y-velocity kymographs for +Blebb MDCK cells (G) and T151 cells (N) were averaged in the y-direction to obtain the overall y-direction cell velocities at each time point with shear (dashed black line). The range (gray bars) and mean (black crosses) of three independent experiments at each time point (E, G, L, N) are shown. (Simulation) Normalized output of the MATLAB Simulink/Simscape simulation for the mechanical model (Figure 2—figure supplement 1). Kymograph assembly, color maps, data binning, and numerical integration over time were as in Figure 1. MDCK E-cadherin:DsRed monolayer imaged for imaged 1 h before shear and 19 h after shear. Blebbistatin was added 15 min prior to shear and washed out 1 h later. Blebbistatin was added 90 min after shear and washed out 1 h later. Actomyosin contraction is coordinated between cells via linkage to the E-cadherin cell-cell adhesion complex (Yonemura et al., 2010). To distinguish the cytoplasmic actomyosin-anchoring role of E-cadherin from its extracellular, tension-dependent trans-cell adhesion role, we used MDCK cells expressing an E-cadherin extracellular domain mutant (T151 cells [Troxell et al., 2000]). E-cadherin in T151 cells has a truncated, nonfunctional extracellular domain, but an intact plasma membrane-tethered cytosolic tail that binds actin through catenins (Troxell et al., 2000). Importantly, expression of T151 E-cadherin results in the down-regulation of endogenous E-cadherin, but other cell-cell junctions maintain monolayer cohesion (Troxell et al., 2000). Shear did not induce inward/outward y-direction movements of T151 cells (Figure 3H,I; Video 6), unlike the +Shear condition in MDCK cells with normal E-cadherin (Figure 1D,E). This result indicates that extracellular E-cadherin trans-cell adhesion, and not other cell-cell junctions, was specifically required for the propagation of oscillatory y-direction cell movements after shear. Similar to the blebbistatin-treated epithelium of MDCK cells and the +Shear condition, 2–3 layers of T151 cells adjacent to the shear-plane (<50 μm) moved in the x-direction opposite to shear (Figure 3J,K), confirming that passive deformation of the monolayer is independent of E-cadherin trans-cell adhesion. The sensing data (Figure 3L) revealed no statistical difference in FMAX and τ compared to the +Shear condition (Figure 2—figure supplement 2). In our mechanical model, similar to the blebbistatin-treated MDCK epithelium (Figure 3F), the inverse relationship between the size of the inerter and the rate of signal propagation leads to a much larger inerter value (b) than in the +Shear condition (Figure 3M). The vertical average of y-velocity kymographs (Figure 3H) also did not exhibit any oscillatory behavior (Figure 3N, Experiment), which was also captured by the simulation (Figure 3N, Simulation). Taken together, data from T151 cells demonstrate that damping is unaffected by the loss of E-cadherin trans-cell binding, but E-cadherin transcellular engagement is required to relay the mechanical signal from the shear plane through the epithelium. MDCK T151 monolayer imaged 1 h before shear and 19 h after shear. We next examined whether shear-induced cell movements were affected by reducing actin dynamics and increasing actin filament length by adding jasplakinolide (200 nM; (Bubb et al., 1994)) 15 min before shear for 1 h (Figure 4A–G; Video 7); immunofluorescence imaging confirmed that 200 nM jasplakinolide led to the reorganization of long actin filaments in this cell type (Figure 4—figure supplement 1). After shear, jasplakinolide treated cells moved inward in the y-direction at a rate (10 μm/h; Figure 4A) 3x slower than in the + Shear condition with untreated cells (30 μm/h). This inward movement propagated to the edge of the plank at a rate 8x faster than the average cell velocity (80 μm/h vs.10 μm/h), but 3.6x slower than the initial rate in the + Shear condition with untreated cells (290 μm/h, Figure 1D). Jasplakinolide treated cells reversed y-direction movements at 7, 9.5, 13, and 17 hr after shear, but without decreasing velocity magnitude (Figure 4A,B): the magnitude of oscillations was maintained. After jasplakinolide treatment, cell movement in the x-direction was opposite to the applied shear (Figure 4C,D) similar to the +Shear condition with untreated cells (Figure 1F,G), although the x-direction movement propagated to cells further from the shear plane. These results indicate that regulation of actin dynamics and actin polymer length is involved in propagating and damping shear-induced oscillatory cell movements in both the x- and y-directions. Reducing actin dynamics with jasplakinolide prolonged y-direction oscillations. (A, C) y- (A) and x-velocity (C) kymographs from three independent experiments with 15 min binning of three 5 min PIV data of cell movements of MDCK E-cadherin:DsRed cells treated with 200 μM jasplakinolide and sheared (dashed black line) over 20 h. (A–D) Jasplakinolide was added 15 min before shear (filled arrowhead) and washout one hour later (empty arrowhead). (B, D) y- (B) and x-direction (D) cell movements at positions 8, 50, 100, 150, 200, and 242 μm from the shear-plane, with inset providing greater spatial resolution (D), inset of movement in the deformation zone. (E) Measured resistive force of the epithelium over 30 min in response to 100 μm shear displacement (dashed line, time of shear; solid blue bar, 63.2% decay time constant τ; Figure 2—figure supplement 2) decayed more slowly than + Shear (Figure 2A), suggesting higher damping. (F) Values of the mechanical model elements in Figure 2B (+Shear) were increased (blue) or decreased (red) to capture the mechanics and movement of the epithelium. (G) (Experiment) Unbinned (5 min) y-velocity kymographs were averaged in y-direction to obtain the overall y-direction cell velocities at each time point with shear (dashed black line). Range (gray bars) and mean (black cross) are shown for three independent experiments at each time point. The red line represents the best fit of an exponentially decaying sinusoidal function (Figure 2—figure supplement 1B) to the average y-direction cell velocity (E, G). (Simulation) Normalized output of the MATLAB Simulink/Simscape simulation for the mechanical model (Figure 2—figure supplement 1). Kymograph assembly, color maps, data binning, and numerical integration over time are as Figure 1. Jasplakinolide was added 15 min prior to shear and washed out 1 h later. The sensing data from the jasplakinolide treatment revealed no statistically significant difference in FMAX, but a much slower (Figure 2—figure supplement 2C, p<0.05) relaxation time (τ = 6.2 min) compared to the +Shear condition with untreated cells (τ = 3.7 min). In our mechanical model, the slower force relaxation time corresponds to an increased damping (c), while the similar rate of mechanical signal propagation (80–100 μm/h) leads to the same inerter value (b) compared to the +Shear condition with untreated cells (Figure 2B). The vertical average (Figure 4G, Experiment) of y-velocity kymographs (Figure 4A) showed that the inward/outward oscillations of jasplakinolide treated cells took much longer (p<0.05) to dampen, although with no statistically significant difference in oscillation period compared to the -Shear or +Shear conditions with untreated cells (Figure 2—figure supplement 2). Again, the simulation (Figure 4G, Simulation) captured the observed long-term oscillations after applied shear (Figure 4G, Experiment). Thus, reduced actin dynamics and longer actin polymer length increased damping and slowed the dissipation of the mechanical signal within the monolayer, leading to prolonged oscillations. Collectively, our results support the idea that local shear affects the epithelium in two spatially and temporally distinct phases, each with different dependencies on the actin cytoskeleton and E-cadherin-mediated cell-cell adhesion. In one phase, x-direction movements and deformations in 2–3 cell layers adjacent to the shear-plane are independent of the organization and contraction of the actin cytoskeleton, and E-cadherin trans-cell adhesion. These movements last several minutes, and do not oscillate except when actin dynamics are disrupted. In another phase, y-direction cell movements in the epithelium behave as a damped oscillator, requiring actomyosin contraction, actin filament dynamics, and E-cadherin-mediated cell-cell adhesion; these movements persist for tens of hours. Based upon our simulations and experimental data, we suggest that transient local deformation of 2–3 cell layers adjacent to the shear-plane generates a mechanical event that is relayed across the epithelium over tens of hours. Cell movements at the shear-plane may induce tension on E-cadherin in cells adjacent to the deformation zone, and tension on E-cadherin increases actomyosin contraction and cell stiffening (Borghi et al., 2012; Buckley et al., 2014; le Duc et al., 2010). Therefore, we suggest that the mechanical event from the deformed cells is transmitted throughout the epithelium via direct coupling of actomyosin contraction and E-cadherin cell-cell adhesion (Borghi et al., 2012; Buckley et al., 2014; le Duc et al., 2010; Yonemura et al., 2010). Note that a temporary (1 h) loss of actomyosin contraction blocked long-term (24 h) y-direction cell oscillations even though actomyosin contraction was re-established after blebbistatin washout (+Blebb; Figure 3A). These data indicate that with the loss of actomyosin contractility, the generated mechanical signal dissipated, which enabled the epithelium to immediately reach a new external force balance. We suggest that dissipation of the mechanical signal under the -Shear and +Shear conditions occurred through oscillatory cell movements over >15 h, which gradually damped global cell movements as a new external force balance was reached. The longer force relaxation time constant for cells treated with jasplakinolide showed that damping was significantly increased (Figure 4E) because of the longer, stable actin filaments that formed in the presence of jaspakinolide (Figure 4—figure supplement 1). Extrapolating from our experimental data (Figure 4G, Experiment) beyond the period of observation indicates that oscillations would have persisted for approximately 80 h after shear. Jasplakinolide stabilizes and increases actin filament length (Bubb et al., 1994), which could generate a more viscous actin network that causes the epithelium to act like a material with longer polymeric chains and high damping (Kim et al., 2016). This change in physical characteristics may also explain why oscillations occurred in the x- as well as the y- direction after jasplakinolide treatment (Figure 4A and C). Thus, normal actin filament dynamics and turnover may be required for oscillation damping and dissipation of the mechanical signal generated by shear, which are required to reach a new force balance. We can rule out the possibility that changes in cell density over the time of the experiment affected the response of the epithelium to shear. We detected little or no cell extrusion of dead cells (Video 1), and the amount of cell division was similar under all experimental conditions with or without shear (Videos 1 and 3–7). Furthermore, the cell density was between 6,000–10,000 cells/mm2, due to temporary local variations, regardless of the application of shear (Figure 1—figure supplement 4vs. Figure 1—figure supplement 6), and either in the presence of blebbistatin (Figure 3—figure supplement 2) or jasplakinolide (Figure 4—figure supplement 2). Our results suggest a mechanism for the spontaneous oscillation of confined epithelia (Deforet et al., 2014; Kocgozlu et al., 2016), which are important model systems for embryo development and tumor progression. Spontaneously generated shear forces (Prost et al., 2015) in these epithelia produce a normal stress towards the shear plane, (Janmey et al., 2007). These researchers posited that their results were relevant to the study of biological tissues and, indeed, may be applicable to our work because of the short time scales associated with reaching peak force (Figures 2A, 3E, L and 4E). These spontaneously generated shears lead to a force imbalance that is eliminated through the inward/outward oscillation of the epithelium. Here, we reconstituted a similar imbalance by applying a larger external shear force to the epithelium (+Shear), which led to a response similar in type but larger in magnitude to the condition where no external shear force was applied (-Shear). This new understanding was made possible by the ability to apply a localized and quantifiable shear force. In summary, our novel device and results answer the question of how local shear on cells induces global changes in multicellular organization. Using an intrinsic mechanical signal storage and relay element, we capture the generation of forces by local shear in active, living tissue, and how this signal is propagated and eventually dissipated through oscillatory cell movements. Mechanistically, a force imbalance is generated through local deformation of a few cells by shear. The sensing and restoration of this force imbalance requires tension developed by actomyosin contraction linked to E-cadherin cell-cell adhesion. Our results provide new insights into the mechanical basis of collective cell movement in tissues. Madin-Darby Canine Kidney (MDCK) type GII cells stably expressing E-cadherin:DsRed (Troxell et al., 2000) or truncated E-cadherin (T151, under control of a doxycycline-repressible promoter, Troxell et al., 2000) were cultured at 37°C and 5% CO2 in Dulbecco’s Modified Eagle Medium (DMEM) low-glucose (200 mg/L) medium supplemented with 10% fetal bovine serum (FBS) (MDCK Ecad:DsRed) or tetracycline-free FBS (Clonetech, 631106) (T151), 250 μg/mL G418, and 1 g/L sodium bicarbonate, penicillin (30 μg/mL), kanamycin (1 mg/mL), and streptomycin (30 μg/mL). Blebbistatin was added 15 min before shear (50 μM, Figure 2A–D) or 1.5 hr after shear (50 μM, Figure 1—figure supplement 7A–D) for 1 hr and then washed out with fresh media. Jasplakinolide (0.2 μM, Figure 2E–H) was added 15 min before shear for 1 hr and then washed out. All cell lines were tested for mycoplasma prior to experimentation using the LookOut Mycoplasma PCR Detection Kit (Sigma, MP0035). Silicon Microelectromechanical Systems devices were fabricated at the Stanford Nanofabrication Facility from 4-inch silicon wafers (50 μm device layer) using principles and methods presented previously (Mukundan and Pruitt, 2009; Sadeghipour et al., 2017). Newly fabricated devices were hydrated in 70% ethanol, rinsed in MilliQ water, and rinsed in 0.01% acetic acid prior to coating with collagen (Corning, 354236, 50 μg/mL in 0.01% acetic acid for 1 hr at room temperature). Devices were re-used after cleaning them with collagenase (2.4 g/mL; Sigma-Aldrich, C0130) for 30 min at 37°C. Devices were placed in concentrated Clorox Regular Bleach for 48 hr, washed in MilliQ water twice for 5 min, incubated in ethanol for 3 hr, rinsed in MilliQ water, and rinsed in 0.01% acetic acid. Cleaned devices were coated with collagen I. Each device was placed in DMEM imaging medium with 50 mM HEPES and 1.8 mM Ca++ (Thermofisher, 15630080) supplemented with 10% FBS and 1 g/L sodium bicarbonate and antibiotics as above. A 3D-printed acrylonitrile butadiene styrene holder was used to center and hold the device in a 35 mm polystyrene culture dish. Cell monolayers were dissociated with 0.05% trypsin-EDTA (Life Technologies, 25300–062) for 6 min at 37°C. Cells were resuspended at a concentration of 1.5 × 106 cells/mL in low-calcium (5 μM Ca++) DMEM. A glass capillary tube with an inner diameter of 500 μm was attached to a Rainin p10 micropipette tip. Using a turn-dial micropipette,~2700 cells were pipetted onto the two combined 1000 × 250 μm planks of the device, which was submerged in DMEM imaging medium plus 1.8 mM Ca++. The open dish was sealed with mineral oil to prevent evaporation while allowing the insertion and micro-manipulated control of a needle to move the planks. After 1 hr, the medium was agitated to remove non-adherent cells; shear was applied after a further 18 hr. The position of the ‘actuating plank’ was controlled with a needle attached to a 3-axis micro-manipulator (Newport Corp., UMR8.25), while the force was inferred from the position of the second, spring-loaded ‘sensing plank’ (Figure 1—figure supplement 1A). The actuating plank was displaced 100 μm in the positive x-direction and held for the duration of the experiment (24 hr), which caused in-plane shear deformation at the mid-plane of the monolayer. The rate of shear displacement was ~20 μm/s. The 100 μm in-plane shear did not rupture individual cells, cell-cell adhesions, or the cell monolayer as a whole. Cells were imaged with a Leica DM-RXA2 microscope and a Hamamatsu Orca-R2 camera encased in a black acrylic incubator at 37°C achieved using an Air-Therm ATX. A Leica fluorescent 10x objective was used for all experiments. Images were taken for 45 min at 5 min intervals, and for 15 min at 30 s intervals for a total of 1 hr prior to the application of shear. MDCK E-cadherin:DsRed cells were imaged both in bright field and Texas Red channels to visualize cell shape and sense forces; T151 cells were imaged in only bright field. Images during shear were captured at 200 ms intervals and binned by 2 × 2 for a final resolution of 2.12 pixels/μm. Immediately after shear, images were captured every 30 s for 45 min, and then every 5 min for 23.25 hr. Fluorescent cell boundaries of MDCK E-cadherin:DsRed cells were used to segment individual cells in the monolayer using custom MATLAB code (Sadeghipour and Garcia, 2018) based on techniques presented previously (Harris et al., 2012; Hart et al., 2017). Two sets of images were compiled in 5 min interval stacks, 1 hr before shear and after shear for a total of 302 images. Images were divided at the mid-plane to separate the actuating and sensing planks as top and bottom, respectively. Images in each stack were rotated to horizontally align planks and then matched to the first image using the Fiji Template Matching plugin (ImageJ version 2.0.0). The middle third of both the top and bottom planks were cropped for processing to eliminate edge affects of the plank’s arms. Image pixel dimensions are 468 × 390 pixels/μm. PIV was performed using MATLAB PIVlab 1.41 (The MathWorks). Images were loaded with a 1–2, 2–3, 3–4 style. An Fast Fourier Transform (FFT) window deformation PIV algorithm was used with a first pass interrogation size of 120 pixels with step size 60 pixels, and a second pass interrogation of 48 pixels with a step size of 24 pixels. Window deformation was linear and the method for sub-pixel displacement estimation was Gauss 2 × 3 point. A vector validation with interpolation was applied with these settings: velocity standard deviation filter threshold at 4, local median threshold at 5, epsilon set to 0.1. Velocity and vector data were exported as a. mat file to generate cell velocity kymographs. PIV data from 300 μm x 250 μm (width x height) images were divided into 18 × 15 (width x height) data sets to generate the kymographs. Velocity vectors were averaged horizontally for a final data set of 1 × 15 (width x height). We have provided all source data for each figure as well as the custom Matlab codes (Sadeghipour and Garcia, 2018) used to process the data and generate plots. These files can be viewed and downloaded using this link; osf.io/kvu5j. For the mechanical model, stiffness (k) was held constant across experimental conditions, and damping (c) was calculated based on c = kD, from the equation for an exponentially damped sinusoidal function (Figure 2—figure supplement 2B). We ensured that the trend in damping values in the mechanical model corresponded with the trend of the τ values from the force relaxation experiments, as τ is a corollary for damping (Figure 2—figure supplement 1B). The value of the inerter (b) was inversely related to the rate of propagation within the epithelium, which led to an effectively infinite value where the rate of propagation was zero (+Blebb, Figure 3A; T151, Figure 3H). When the rate of propagation was not zero (+Shear, Figure 1D; -Shear, 1H; and +Jasp, Figure 4A), the value of the inerter (b) was chosen to achieve a mechanical system with an intrinsic period (P) of 8 hr, where b = kP2/(4π2), based on the statistical tests performed and shown in Figure 2—figure supplement 2. Statistical significance of the results was analyzed using a combination of the Kruskal-Wallis and the Mann-Whitney U tests. These non-parametric statistical tests are appropriate when data are not normally distributed. Using data from two experimental conditions in all cases, the Kruskal-Wallis test allowed us to determine whether the results of our different experimental conditions represented different populations. If this test was positive (p<0.05), we instead used a pairwise non-parametric Mann-Whitney U test. In Figure 2—figure supplement 2 we have used red to denote the results using Kruskal-Wallis tests, and black to denote the results using Mann-Whitney U tests. The Journal of Biological Chemistry 269:14869–14871. 243–265, Mechanotransduction in development, Forces and Tension in Development, Academic Press, 95, 9780123850669. What is the young's Modulus of Silicon? Journal of Microelectromechanical Systems 19:229–238. Material Selection, Design, and Application, Handbook of Thermoplastics, Second, Boca Raton, FL, CRC press. The Journal of cell biology 189:1107–1115. Journal of Microelectromechanical Systems 18:405–413. New Journal of Physics 19:033006. Solid-State Sensors, Actuators and Microsystems (TRANSDUCERS), 19th International Conference on 2017. pp. 202–205. Journal of Micromechanics and Microengineering 21:054016. Journal of Cell Science 113:985–996. Thank you for sending your article entitled "Shear-induced Damped Oscillations in an Epithelium Depend on Actomyosin Contraction and E-cadherin Cell Adhesion" for peer review at eLife. Your article has been reviewed by Anna Akhmanova as the Senior Editor, a Reviewing Editor and three reviewers. This timely and intriguing manuscript addresses the response of epithelial sheets to shear forces. The authors show that oscillations in cell movements and actin turnover are used to respond to shear forces and return to equilibrium. The authors have conceived innovative and unique technology to explore the phenomenon and use a combination of experiments and theory to analyze the effect of shear on epithelial monolayers. Overall the manuscript is clearly and well written and the experimental data is of good quality and convincing. The reviewers agreed that the manuscript will be broadly of interest to several fields and the data acquired in this study are novel, unique, and are of high quality. However, the reviewers agreed that are some issues that still need resolved and clarified. These include justification for key experimental parameters, further justification for physical interpretation of the data, key biological controls, and improved statistical analyses. 1) The authors base their model, which is at the heart of the study, on the assumption that the viscoelastic properties of the monolayer are not altered by shear (k is constant). Along these lines, in the simulations the oscillations appear more sustained and higher amplitude than in the actual experiments, which could be an indirect indication that the monolayer changes its mechanical response to shear, leading to non-linear dissipation of the oscillations. The authors should quantify the mechanical properties of the monolayer during the response to shear using direct or indirect methods (AFM, traction force etc., depending on what is compatible with their setup) to justify this assumption. 2) The role of E-cadherin is interesting, but the authors statement that the mechanism involves induction of tension on E-cadherin has not been sufficiently explored. The authors could look using IF at the α-18 epitope accessibility and vinculin recruitment as indirect but straight forward readouts of tension, or alternatively use laser ablation to quantify tension over junctions. Is the distribution of E-cadherin changes and does it display anisotropy in respect to the direction of shear? 3) The role of actin remodeling remains vague, and the statement on the role of actin at the end of the abstract appears too strong given that it is based on just the jasplakinolide experiment. Additional experiments should be performed to clarify this and justify the conclusion. Are there changes in the organization of the F-actin cytoskeleton? More x-linking, fiber elongation? What happens to myosin II activity over time and where is the myosin activity localized, is it at junctions. Does myosin activity oscillate? 4) The reviewers had concerns about the large shear forces and how they affect the cells. The authors should analyze whether cell adhesion, shapes or rearrangements are observed in response to shear, the experiments should be repeated at a lower shear strain amplitude to ensure that the data can be interpreted as a purely mechanical phenomena or other explanations of the data should be provided. Additionally, is cell death/damage induced by the large shears? Evaluation of a live/dead cell stain could alleviate concerns that cell death is occurring. Similarly, the use of non-permeable cell dyes could be used to discern if micro-tears are forming in the cell membranes at the shear plane. Both of these control experiments should be performed to assess the affects of the shear strain on cell health in the MEMS device. 5) The asymmetric cell oscillations (being larger in y than in x, the shear direction) is understandable for the application of shear. However, the explanation for asymmetric oscillations for unsheared cells observed in Figure 1H-K is unclear. In particular, what is the origin of the symmetry breaking cue? Is this due to the different sizes of the x- and y-axes in the MEMS device? If square MEMS devices were used would asymmetric oscillations be observed? The authors claim the oscillations are governed by actin dynamics. Are the actomyosin networks of the cells asymmetrical in terms of their dynamics or distribution even in the absence of shear? Currently, the observation of the oscillatory motions in both unsheared and shear conditions is interpreted as due to similar mechanisms, but different in amplitude due to differences in the amplitude of the applied shear. However, how the "intrinsic forces" and the applied force have similar directionality is unclear. The similarities of the oscillations in sheared and control conditions could be coincidental due to geometrical constraints of the MEMS device or other issues. In general, further analysis and explanation of the origin of intrinsic oscillations, and their relation to the shear-induced oscillations needs to be added to the manuscript. This could include the experiments suggested in this comment or other experiments deemed more pertinent by the authors. 6) There are a variety of mechanical models and/or physical systems used to explain the various aspects of the epithelia. At various times, the cell layer is considered analogous to a semi-flexible polymer network (work of Janmey), an active gel (work of Prost), and a mechanical circuit. These descriptions are not all compatible. For instance, comparing a cell layer to a semi-flexible polymer network is problematic, as this ignores the active nature of the cells as well as the presence of cell-cell contacts. The comparison to Janmey's work demonstrating the negative normal stresses is particularly problematic because of key microstructural and time scale differences between the systems. The origin of the negative normal stresses in Janmey's work is due to a non-symmetric force extension curve of an individual semi-flexible polymer. If the force-extension curves of cells exhibit a similar asymmetry is not known to this reviewer. Also, the responses observed in Janmey's work occurred within seconds, here the maximal "stresses" in the epithelial occur within hours. This suggests that the observations in this manuscript are due to other mechanisms, likely related to cell migration. If the authors wish to continue using the analogy to Janmey's work, they should demonstrate that cells display the negative normal deformations without active processes to match the conditions in Janmey's work. The easiest way to due to this is through ATP-depletion, but this will likely have substantial biological consequences. The mechanical circuit model, with the inclusion of the inverter, is a novel addition to the field and very interesting. Alternatively, the authors could choose to focus on this model, providing greater explanation of the physical interpretation of the inerter in terms mechanosensitive signaling and remove some the discussion of the polymer physics / active matter. 7) The mechanical circuits have a key time scale of 8 hours. This is a very long time-scale to be associated with actin filament dynamics in living cells, where actin turnover is usually quite high. Jasplak is also known to be a potent anti-proliferation agent. This suggest that cell division could play a key role is dissipate stress in this system. Experiments where cell proliferation is inhibited should be performed to demonstrate or exclude the role of cell division in the dissipation of stresses in the system. First, any such changes must be small, as a large change would also change the period of oscillations. We do not observe such statistically significant change in the period of oscillations with or without shear (Figure 2 —figure supplement 1C). Second, the cells on this device are placed on suspended micro-fabricated silicone planks, and the device has been integrated with an upright Leica microscope. None of the common stiffness measurement tools, including those mentioned by the reviewer (e.g., AFM, traction force, etc.) are compatible with this setup. Finally, we have presented the simplest mechanical model that reasonably matches the mechanical behavior of the cell monolayer by placing all elastic behavior into a single spring, all damping behavior into a single damper, and all mechanical signal storage and relay behavior into a single inerter. The addition of more springs, dampers and inerters in parallel or in series might refine the model but at the expense of increasing complexity. Moreover, such refinements would not alter our conclusion that a storage and relay element (inerter) is required to model monolayer behavior. The role of E-cadherin in transmitting tension across cell-cell junctions has been well established (for example, Borghi et al., Yonemura et al., De Rooji et al.). However, instead of indirect methods for assessing whether there was tension on E-cadherin (alpha-18 epitope accessibility, or vinculin recruitment), we wanted to test directly whether tension on E-cadherin specifically was required for the observed oscillatory effects of shear on the cell monolayer. We used a well-characterized MDCK line that expresses a mutant E-cadherin that lacks the extracellular domain (T151), but also lacks endogenous E-cadherin. In T151 cells the tension on E-cadherin is necessarily zero, but cytoplasmic binding partners are retained, and other cell-cell junctions are preserved. Strikingly, we found that shear-induced oscillatory movements of cells completely disappeared. Since other cell-cell junctions are present in T151 cells, we can conclude that shear-induced tension transmission between cells in the monolayer is through E-cadherin. Staining for vinculin, for example, would not provide this critical information. Finally, we examined the localization of E-cadherin-RFP in cells and did not find any change in localization upon or during strain. Finally, the device has been integrated with an upright Leica microscope, and it is not possible to quantify tension over junctions with laser ablation. We will provide high magnification images of the cell-cell junctions as a supplementary figure in a revised manuscript to show no change in the localization of E-cadherin due to shear. Our conclusion is based on the work of others reporting that jasplakinolide reduces actin depolymerization and increases actin filament length (Bubb et al., 1994). Determining the proper concentration of jasplakinolide is important, so that cell death is not induced but actin dynamics and organization are affected. This can be dependent on cell type and thus we chose 200 nM based on prior work of (Moore et al., 2014). They too used an epithelial cell type treated with 200 nM jasplakinolide and found that this led to a large immobilization of the F-actin network on the lateral sides of cell-cell junctions. We confirmed F-actin reorganization in our cells through IF. Moore et al. proposed that these large F-actin structures could lead to increased tension, as also reported by (Wu et al., 2014). Our work indicates that changes in epithelial mechanics may be altered by changes in the organization (dynamics, polymer length) of the F-actin cytoskeleton. Notably, (Kim et al., 2016) showed that such material would have high damping and, according to our mechanical model, changing that alone simulates the effects observed in sheared jasplakinolide-treated cells. Finally, determining structural changes of F-actin in cells treated with jasplakinolide is complex, particularly in the context of “cross-linking and fiber elongation” suggested by the reviewer, neither of which can be directly measured by imaging methods available on this device. 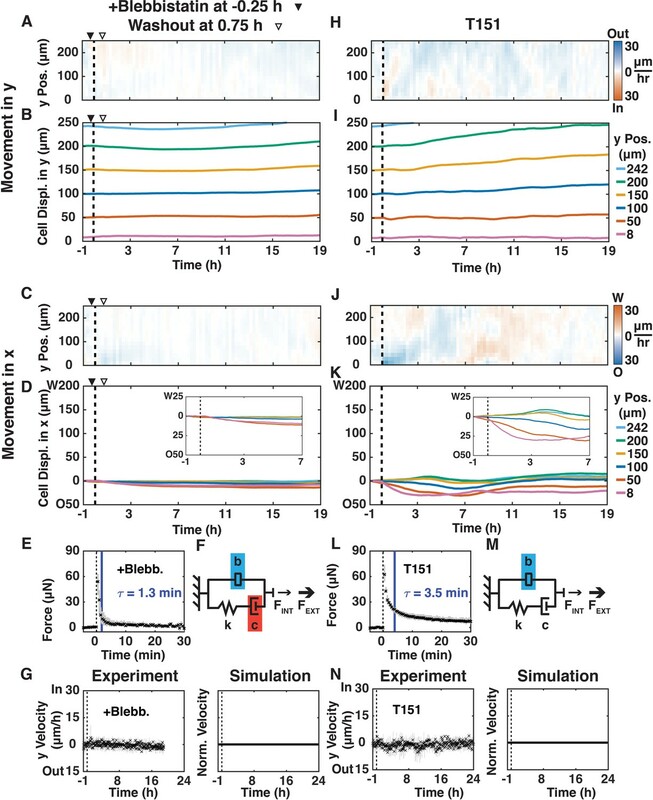 While we agree that analysis of myosin II localization could be interesting, our goal was to test whether actomyosin activity was required for shear-induced oscillatory movements of cells. Our analysis using blebbistatin shows directly that actomyosin activity is required; localization of myosin II would not enhance or change the conclusions from this direct experiment. We reported in Figure S4 that cell shape changes did not match the long-term y-direction collective oscillations. However, we also reported that cells at the shear plane did change shape immediately after shear (Figure 1). We agree that this can be stated more directly in the text, and we can provide images of cells in the shear zone before and after shear at a higher magnification. As for cell adhesion and rearrangements, cells retain their neighbors throughout the experiment and any new cell adhesions are formed normally between divided cells and their neighbors. We will provide this information as a supplementary figure in the revised manuscript. The cell monolayer does not rupture upon shear and throughout the shear experiments. We will provide images of cells that were sheared and then separated in tension showing a contact monolayer suspended between the two planks as a supplementary figure in the revised manuscript. MDCK cells have a well-known mode of extruding dead cells. At no time during shear did we see cell extrusion at the shear plane to indicate shear causes cell death. We will provide movies of sheared MDCK monolayers to support this observation. (Kocgozlu et al., 2016) and (Deforet et al., 2014) used MDCK cells cultured on circular patterns, and found that the cells underwent periods of spontaneous oscillations in direct proportion to the pattern diameter. Significantly, on patterns with a diameter of 500 μm (the same as the combined width of the two planks in our shear device) they observed intrinsic oscillations with a period of ~8 h which we also observed. Neither Kocgozlu et al., Deforet et al., nor we know the origin of spontaneous oscillations in cell monolayers; a speculation is that the oscillations result from the spontaneous shear forces in the monolayer (Prost et al., 2015) where these spontaneous shear forces create tension forces pointing inwards (Janmey et al., 2007) that lead to long-term inward/outward oscillations. We will modify the text in the manuscript to emphasize this point. 6) There are a variety of mechanical models and/or physical systems used to explain the various aspects of the epithelia. At various times, the cell layer is considered analogous to a semi-flexible polymer network (work of Janmey), an active gel (work of Prost), and a mechanical circuit. These descriptions are not all compatible. For instance, comparing a cell layer to a semi-flexible polymer network is problematic, as this ignores the active nature of the cells as well as the presence of cell-cell contacts. The comparison to Janmey's work demonstrating the negative normal stresses is particularly problematic because of key microstructural and time scale differences between the systems. The origin of the negative normal stresses in Janmey's work is due to a non-symmetric force extension curve of an individual semi-flexible polymer. If the force-extension curves of cells exhibit a similar asymmetry is not known to this reviewer. Also, the responses observed in Janmey's work occurred within seconds, here the maximal "stresses" in the epithelial occur within hours. This suggests that the observations in this manuscript are due to other mechanisms, likely related to cell migration. If the authors's wish to continue using the analogy to Janmey's work, they should demonstrate that cells display the negative normal deformations without active processes to match the conditions in Janmey's work. The easiest way to due to this is through ATP-depletion, but this will likely have substantial biological consequences. The mechanical circuit model, with the inclusion of the inverter, is a novel addition to the field and very interesting. Alternatively, the authors could choose to focus on this model, providing greater explanation of the physical interpretation of the inerter in terms mechanosensitive signaling and remove some the discussion of the polymer physics / active matter. We sought to place our work in the context of previous studies by others. The various models and mechanisms that the reviewer notes have been ways for different groups to study the effects of mechanical perturbations on biological materials – all of which necessarily simplify the physical world. Janmey et al., clearly state that their results are applicable to living biological tissues, including the movement of organelles within cells and the effects of blood pressure on vascular tissues. We have taken care to benefit from Janmey’s work and other papers in very specific instances where the assumptions are applicable, and not in a disorganized or overly broad way. In the context of the work by Prost, we simply make the point that the physics of an active gel leads to a spontaneous shear term. When combined with the work of Janmey, the normal stress resulting from this spontaneous shear is why we observe cell oscillations even when a shear force is not actively applied. Epithelial migration “average velocity” and not “stress” that peaks 45 minutes after shear. As shown in Figure 2A, Figure 3E, Figure 3L, and Figure 4E, the measured force peaks immediately after shear, and the units of the x-axis on these plots is minutes not hours. We can update the text to further clarify this point. At these short times scales, which are too fast for active processes to take place, the work of Janmey is quite relevant. As we note, some time is required for the mechanical signal about the shear to pass through the epithelium and lead to the peak velocity. We note that the addition of the inerter helped us understand the long time-scales we observed in our data, and the work from Janmey and Prost gave insights on force imbalances that are caused by shear in the monolayer in the short term. Together our work reveals a unique mechanical mechanism of how tissues relay and dissipate force imbalances, which requires it to be active, and is affected when actin polymer length is increased. We will modify the text to emphasize assumptions and conditions that allowed us to benefit from their conclusions. Finally, given the volume of medium, the small number of cells and the length of the experiment we believe that ATP depletion is extremely unlikely. We observe cell divisions throughout the course of all experiments, including those with jasplakinolide. Therefore, any differences in the behavior must result from the treatments, which were different, and not cell division, which was present under all conditions. To exclude the role of cell divisions in the dissipation of stresses in this system we will provide cell density plots from the existing data of drug treated cells. This analysis utilizes cell segmentation and was used for Figure S4. We thank members of the Nelson and Pruitt laboratories for helpful discussions, as well as nano@Stanford staff. Work was performed in part in the nano@Stanford labs, which are supported by the National Science Foundation (NSF) as part of the National Nanotechnology Coordinated Infrastructure under award ECCS-1542152. This work was supported by NIH Training Grant T32CM007276 (MAG), NSF and Stanford Graduate Fellowships (ES), the NIH (R35GM118064, WJN), and NSF (CMMI 1662431, BLP and WJN). © 2018, Sadeghipour et al.